The other day, I was asked to come up with a creative an inexpensive way to gift wrap over 100 books. I went home, found some old butcher paper and a ball of yarn, (leftover from the Christmas stocking I made) and started brainstorming different ideas. #1 "The Bow" - I made a bow using the same method you would use to make a yarn pom-pom, only I didn't cut the ends. I added the square "Merry Christmas" tag to the bottom (I thought it looked like a mini present :) but It's cute with or without the tag. #2 "Basket Weave" - I wrapped the yarn around the present 5 times horizontally and tied off the ends. Then, using a new string, I worked vertically and weaved the yarn over and under the horizontal strands 4 times. #3 "Cats Cradle" remember back in the day when string tricks were cool? Well this is just a simple cats cradle made from one large piece of yarn...if you need a refresher, try THIS tutorial. #4 "Pom Pom" - I'm sure you've all seen this trick, but go HERE if you need a good pom-pom tutorial. 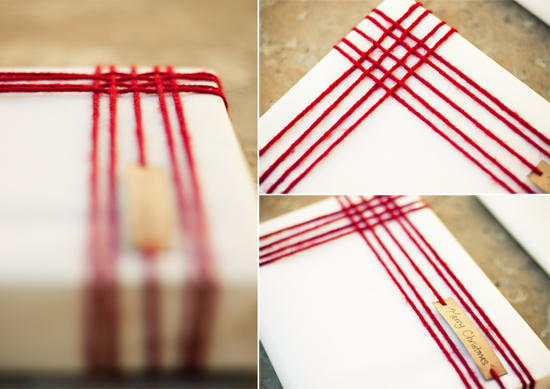 I never would have thought of using cat's cradle as a package decoration...props to you! Love all of these. love these! I so recognized Jacobs ladder...lol...I loved cat's cradle! amazing and great ideas. Thanks. Love the bow version - so cute! 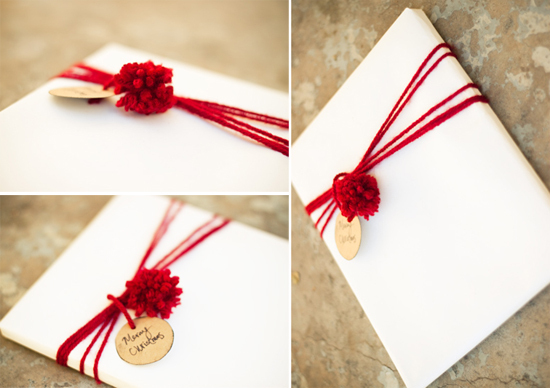 excellent presentation with beautiful posts..
gift wrap idea is awesome..
Those are just beautiful. Great idea. Great pictures. 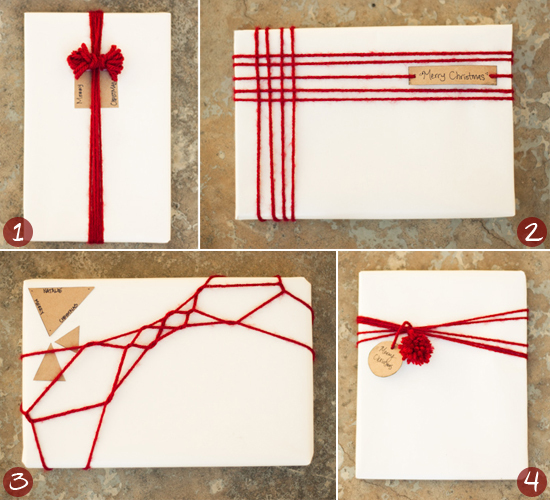 Excellent gift wrap ideas! I really like the basket weave. wahooo ! great ideas ! 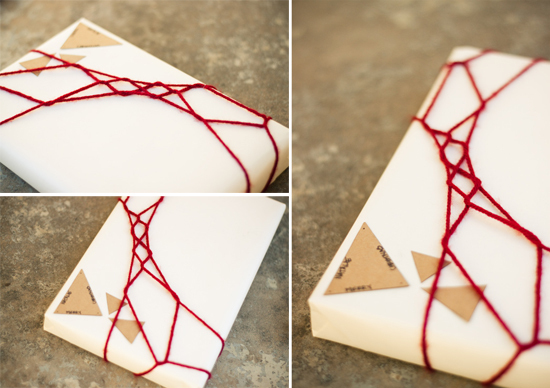 this is one of the best present wrapping tutorials I've ever seen. Thanks so much Andrea! 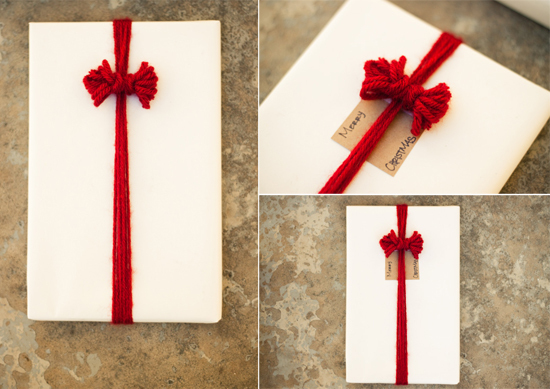 Love your wrapping ideas! Yarn is such a cheap and easily accessible item. Thanks! I linked to you on my blog. Great Post! Thanks for your share! I like reading your post. You can get Satin Ribbon here for gift wrapping!